*Canada Alberta Job Grant will share the cost of this training for eligible Alberta Employees of eligible private companies and non-profit organizations. Some restrictions apply. Email info@investinyou.today for details and eligibility link. 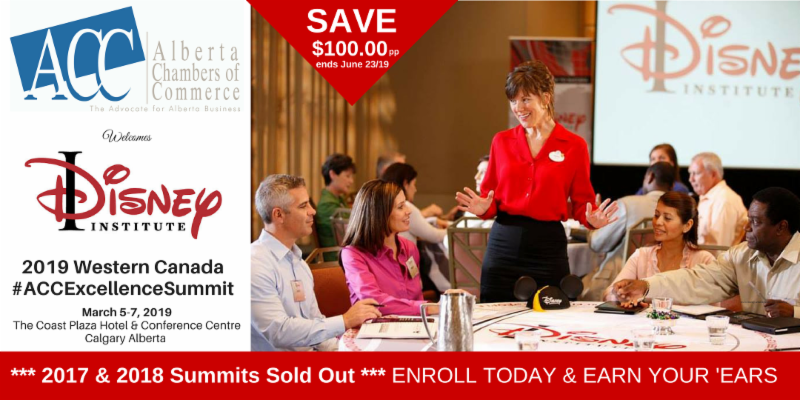 Lethbridge Chamber of Commerce is helping to bring Disney Institute to Calgary so that you can benefit from Disney's Approach To Leadership Excellence, Employee Engagement and Quality Service —key elements of a successful business in pursuit of exceptional customer experiences and sustainable results. Focusing on the customer experience has become the single most important way for an organization to achieve success—often becoming its key differentiator and competitive advantage. You can benefit from learning the Walt Disney Company's proven best practices to ​positively ​impact ​your ​organization ​ and ​the ​customers ​you ​serve ​as ​you are ​immersed ​in ​leadership, work culture and service ​at ​the ​three-day 2019 ​Western Canada ACC ​Excellence ​Summit ​featuring ​ Disney ​Ins titute ​March 5-7, ​2019 ​at ​The Coast Plaza Hotel & Conference Centre in Calgary, Alberta. Thanks to the Alberta Chambers of Commerce sponsorship, the cost of this 3-day summit is 67% lower for you than the exact same courses taught in the United States plus you save exchange rate, time and travel costs. This program is designed for executives, entrepreneurs, professionals, aspiring leaders and front line personnel interested in discovering how the Disney organization drives financial results, generates repeat business, and provides a sustainable long-term competitive advantage. Lethbridge Chamber of Commerce is a Disney approved Marketing Superstar helping to bring Disney Institute to Western Canada.